I am Francisca Afua Opoku-Boateng, born and raised in Ghana, West Africa. I completed my undergraduate degree in Information Technology at Valley View University in Ghana and my Master’s degree in Computer Science and Information Systems from the University of Michigan-Flint. Currently, I am pursuing a Ph.D. in Information Systems with a concentration in Cyber Defense at Dakota State University in Madison, SD. Two years ago, my sister Gloria Opoku-Boateng, Ph.D. was privileged to have been at the 2016 Grace Hopper Celebration. Upon returning home, she did not only share her experience and tell of all the fun and cool stuff she got to do at GHC 16 rather, she also encouraged me to apply for the AnitaB.org scholarship because she would love to go with me the following year. 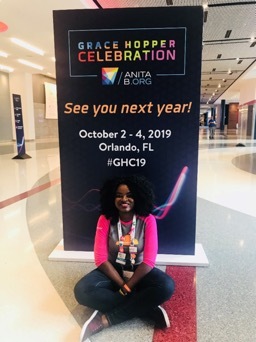 This year her dream came to pass, and I was able to attend the GHC 18. 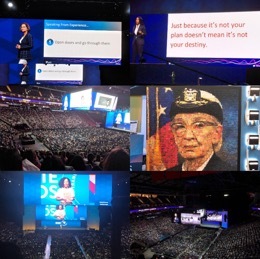 Grace Hopper Celebration (GHC) of Women in Computing 2018 was INCREDIBLY REMARKABLE! There were over 20,000 amazing, talented women technologists present, and I was honored to be one of these wonderful women. Thanks to AnitaB.Org, Dr. Ashley Podhradsky and Dr. Pam Rowland who granted me an incredible opportunity to experience GHC 18. I must confess the conference was an eye-opener for a first timer like myself. As a Cyber Defense student who is very interested in participating in workshops, outreaches and going for conferences, my goal was to connect with as many professionals in my field as I could, build mentoring relationships and develop my peer network. 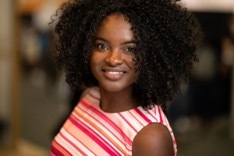 At GHC 18, I felt valued by everyone I met and interacted. This led to a significant growth in my network. I made some good connections with both students in various levels and professionals in my field. GHC 18 was a bit overwhelming for me on the first day and, although some sessions I wanted to sign up for were full to capacity, I was able to sit in other incredible and interesting ones like security and IoT sessions as well as a research luncheon. The opening and closing ceremony for GHC 18 was phenomenal with a FULL house. Jessica Matthews Founder & CEO of Uncharted Power also talked about how she did not plan to be where she is today and didn’t even know how she got there; however, she encouraged us to know that “Just because it’s not your plan doesn’t mean it’s not your destiny.” For the closing keynote, Justine Cassell urged us not to predict the future, rather “we should make it happen and make it one that all women are at the table”. Stopping by the Women in Cyber Security (WiCyS) exhibition center booth and having the opportunity to meet Taly Walsh CEO of WiCyS was my favorite part of GHC 18. I introduced myself and extended greetings from my professors, Ashley and Pam. The excitement that Taly brought was heartwarming! She was SUPER excited and just couldn’t stop talking about how amazing my professors were – not forgetting the good work they are doing with the CybHER organization. I wore a big smile and felt very proud not just for them but also for the fact that I am privileged to be their Graduate Research Assistant. The experience is UNFORGETTABLE! GHC 18 is the best place to be for any young girl, lady or woman in tech who needs that boost, inspiration, empowerment, and revitalization. As women in tech, we sometimes need to be encouraged to exercise our confidence and not just move out of our comfort zones but also surround ourselves with people who say we can. We need to interact with amazing people, like those at the exhibition booths, and hear them share their experiences in the industry, as well as, listen to some awesome highlights of some remarkable things being done in their amazing companies – a reason for everyone to join them. In my opinion, any one gets to go to GHC 19 shouldn’t miss such interactions! 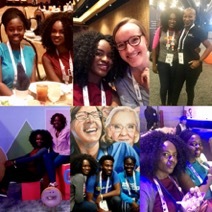 Ultimately, I must confess that I was BEYOND grateful and excited to have had this opportunity to experience GHC 18 and couldn’t wait to share what I learned and experienced with our amazing CybHER ladies. My goal is to use what I have learned and experienced to help them succeed in our field, as well as prep and guide them on how to explore the various opportunities AnitaB.org has for women in tech. Together with Ashley and Pam, I want us to take as many CybHER ladies as we can to GHC 19. As the saying goes, ‘it takes a village to make a professional,’ hence, I believe our CybHER ladies (Upcoming Professionals) will really benefit from the conference next year if, with your help, we are able to make this happen for them as well. Remember, the trending saying at GHC 18 was Girls or Ladies who stay in tech grow up to be women who slay in tech! How cool!